I have been quiet here this month only sharing a few thoughts with you, my friends, on the precious journey we all needed to take to the Stable of Hope. It was a much needed rest for me, as I took the time to seek Him in the quiet recesses that the journey provided for me. And I wonder, what did you find as you prepared for His coming… the advent of the King of Glory and the announcement of His arrival? Perhaps you are still celebrating this moment of joy, or some of you found yourself drawing heavy steps as the days are drawing near to the end of 2014. 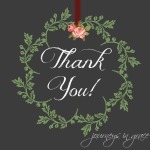 Wherever you are, whatever you are doing, can I just say thank you for walking with me? Thank you for allowing me time with you, to pour into your heart and to press in toward grace together. I have been longing for the chance to have a literal Table of Grace gathering, right here in my own home, for some time. 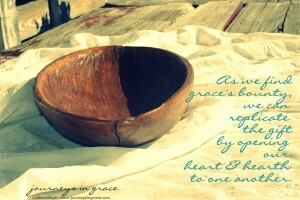 This heart passion I have been writing about repeatedly over the passing months, creating a place of grace where we can gather at a table, it came to fruition as a community here on-line in the Table of Grace Community. Yet, my heart… it also longed for more of a tangible connection where hands and hearts both connected in prayer and in fellowship. A table where grace was literally poured out of pitchers of hospitality, fellowship was mined in the heart of friendly conversations, and prayer was practiced with fervent faith-filled petitions of purpose. 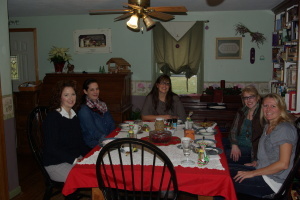 The opportunity to bring grace to my table in a very impromptu breakfast where new friends and dear friends met and blessed each other with the gift of grace. This kind of connecting takes time, effort, and just a bit of planning; and I found that this break in December, this journey to the Stable of Hope as we marked our Advent journey … counting days to His arrival, it was the perfect time to practice this grace-filled hospitality that our hearts are primed to partake of. Here are a few of the blessings that graced my calendar in December as I paused to slow down and enjoy a bit of that silent night. Time soaking up practiced steps as we read the story of the Bethlehem Babe as a family each night seated before the lights and the flame which revealed more of His heart. A pouring into momma hearts of the blessing of trusting His promises. 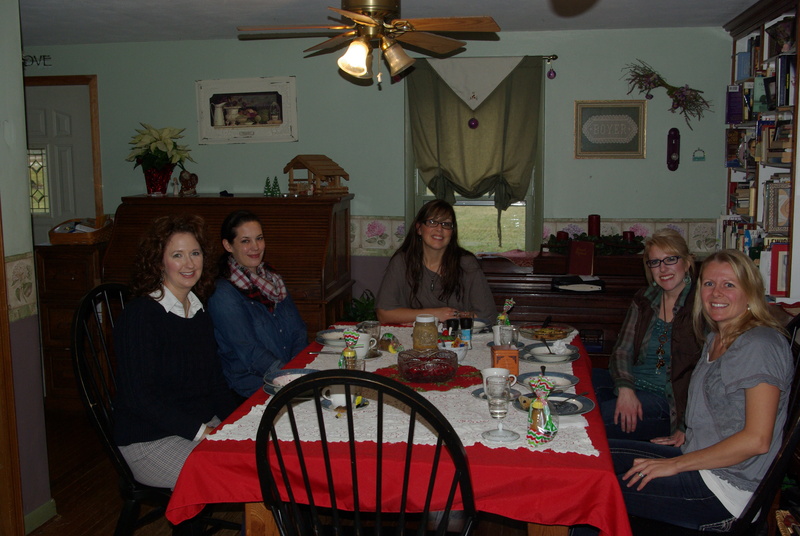 Ladies, Tea, Song, and Serving as a reminder of the Silent Night the shepherds heard the angels singing. Friendship and fellowship over food and laughter and a reminder of all that Mary held deep in her heart. New friends and blessings with books and adventure as this grace table was now brought to a café, and God revealed that prayer connects hearts, even when geography spans the miles. Laughter as daughters are reminded they are precious in light of the journey to the Stable and the table is now in a cantina where joy is spilled abundantly. Remembering those who are no longer with us as we count memories with our steps and pause to dry tears that still flow free. Reuniting with kindred spirits where time melts away in one embrace of grace, and a table takes the form of a coffee shop with winter flavors warm and inviting. Celebrating blessing as family gathers close around the table to receive the hope of heaven together. 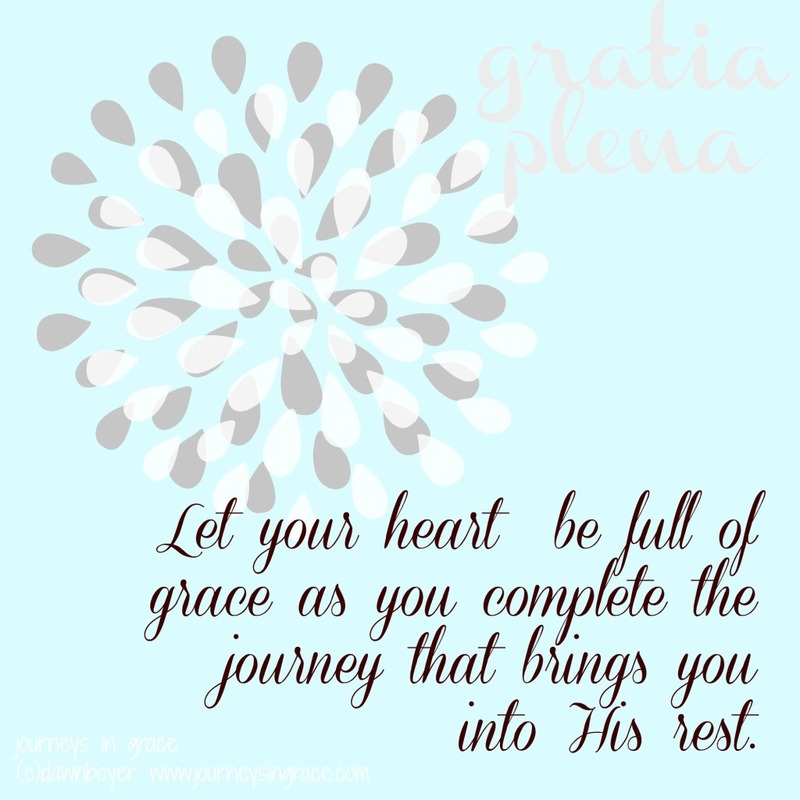 And the reality is this … had I not slowed down long enough to consider the gentle journey to the stable, I may have truly missed the blessing of gathering in grace wherever I found my seat at the table. Like Mary, I found this advent journey was pregnant with promise of a hope that is unquenchable when grace meets my reality. Spending time in the book of Luke this month reminded me of the power of the journey which all pointed to the wood and nail and the connection it makes from our table gatherings… to the manger blessing… ultimately to the Cross of Calvary. Advent reminded me to come to the Father by preparing my heart for Christ’s entrance, the hope we have in the Savior’s birth, the sovereignty of God, and the power of an obedient heart that says, “Yes”, to God. 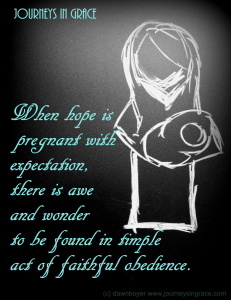 When hope is pregnant with expectation, there is awe and wonder to be found in the simple act of faithful obedience and in this obedient passing we are filled with favor, grace, encouragement, worshipful living, and REST. When our hearts are humbled, through the obedient journey towards God, Grace descends and we find favor, we find rest, we find the source that allows us to pause and contemplate all He has already done which leads us to this continual story of our daily living… of giving.. of sacrifice.. of worship… of love. I am reminded that in order to be the momma, wife, and woman that I long to be, this journey to the stable was the requirement to replenish my weary heart, because the Advent journey also teaches us the power of reflection. I went back to the book of Luke often, to read about a young woman’s journey of faith this Christmas season, and I found myself resting in her song of praise many times. She knew, even then, the act of obedience would cost all she had, but she was willing to give it. She chose to enter the battle ground fully prepared to praise God through it all. And friends, she walked a path of epic proportions. It strikes me deep the power of His redemptive work which is manifest in so many ways. And when we realize the deep need we have to be met by a Holy Loving God, we also learn the power of His magnificent love, His redeeming love, and His merciful love through our trials and sorrows, praises and victories. God has mercy in store, mercy in reserve, for all that have reverence for His majesty and a due regard for His sovereignty and authority. – Matthew Henry. This manifestation of God, His mercy in us, is a glorious work of redemption which brings me to my knees in humble admission that I need this journey every day, not just the season of Advent. It is a daily passing that calls me close. It is a daily filling that brings me near. It is a daily pausing to look with eager eyes. It a daily surrender of heartfelt worship. Don’t stop the journey at the stable, pause and rest a while with the Savior. Can I encourage you today to continue the journey that you started from the Thanksgiving Table, finding hope in the Bethlehem Stable, all pointing to Calvary’s Cross? Will you join me as we spend time with the Babe become Man, who spoke words of life into our souls? Will you come to Table of Grace with me as we bow in prayer joining hands and hearts in fellowship and communion in 2015? Many friends in the blogging world are preparing for the year with One Word. I will write about mine soon, but today, can I challenge you to prepare for the year ahead with a prayer? Would you take time to write out a prayer for the coming year, filled with promise of the year to come and the hope that can only be found in Christ alone? Don’t end your journey at the stable and walk away empty. Take time with the Savior, let Him fill your soul with promise and rest with Him a while. Pour out your words, your goals, your dreams and your desires in a song of praise and magnificence, just like Mary did and write them down in a prayer to keep and to remember as you meet with the days that will accumulate in the annals of your life story. Take time to revisit this exercise in faith through the year and remember the fullness of His grace as you met with Him under the light of His countenance and let your faith continue to grow in the garden of your heart. Prayers of Thanksgiving and Grace for you and all He has planned for you in the coming year! Wonderful post, Dawn. It truly is as we look back over & remember that we can look forward & anticipate. So grateful for the continued faithfulness of our God. May you have a blessed 2015!!! Thanks Joanne! I always smile when I see your comments below a post. This remembering is part of the reason we take the journey, isn’t it? To refresh and remind us of the promises that are already secured and waiting for us to step into them. I just want to sit with you at the coffee shop again and again. Your words have been such a blessing to me, and our time together . . . absolute goodness. You speak such words of grace . . . His grace. And I am just ever so thankful for you. Yes! Let us let the Holy Spirit fill us with grace and peace daily. Thank you for your beautiful post. Visiting via #tellhisstory from http://www.flowingfaith.com. Blessings to you and yours! Dawn, Thank you for such a beautiful, thoughtful reflection and a reminder that these truths are for contemplation in every season. I love the thought of daily pausing with eager eyes. May each day of the new year find it so for you and for me! I am so glad you were able to take this break and slow down a bit, Dawn. What a blessing. I believe those are the times when we truly see God work, when we have those moments of silence to notice it. I know He will continue to work in you and through you in 2015. Glad you were able to take time to slow down, Dawn. I did that too the past week, AFTER Christmas. May you be blessed as you start a new year. May we all grow in taking time for our souls to find rest in God! Beautiful Dawn! I love the Table of Grace Community, and how wise of you to know that it doesn’t replace the literal gathering of hearts in fellowship and prayer. I’m looking forward to walking with you in 2015. Many blessings in this new year! So much wisdom here, Dawn. We need to slow down and let Jesus give us rest to be renewed, don’t we? Carrying this wisdom into the new year with me, friend. Many blessings to you. This is so beautiful! The call to continue the journey that was begun during the Advent season is a call to follow after God with our whole hearts. I love the calm way you describe and weave your words. I am blessed by this post and by the opportunity to get to know you better through your home here and ALLIN. New Year blessings to you!